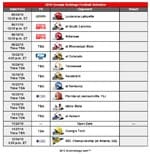 We have updated our 2010 printable Georgia Bulldogs football schedule. The schedule features the game dates and opponent football helmets. Updates include television and kickoff times for the following games: Louisiana-Lafayette, at South Carolina, Arkansas, at Colorado and vs. Florida. The schedule is available in PDF format at the link below. Check out the Sicemdawgs.com Downloads Page for other printable schedules, rosters and more.